Previous message: [Michlib-l] Win funding at Library SOUP: Proposals due today! Good afternoon! Once again, we're hoping you can help us spread the word about the upcoming election on August 8. 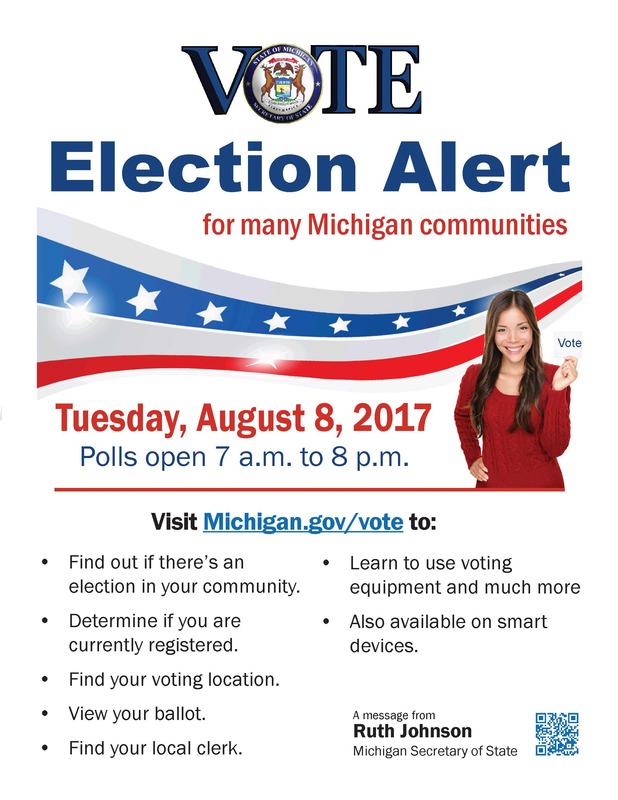 Many local communities across Michigan will be having elections that day, so we're asking all libraries to post the attached flyer where your customers can see it and to share the following message via your communication channels. On Monday, August 7, we will send you a social media message that we hope you will also share. As always, thank you for your help! Secretary of State Ruth Johnson is encouraging all eligible voters in communities hosting elections to cast their ballots on Tuesday, August 8. To determine if your community has an election or to view a sample ballot, visit the Michigan Voter Information Center at www.michigan.gov/vote<http://www.michigan.gov/vote>. The polls are open on Election Day from 7 a.m. to 8 p.m.